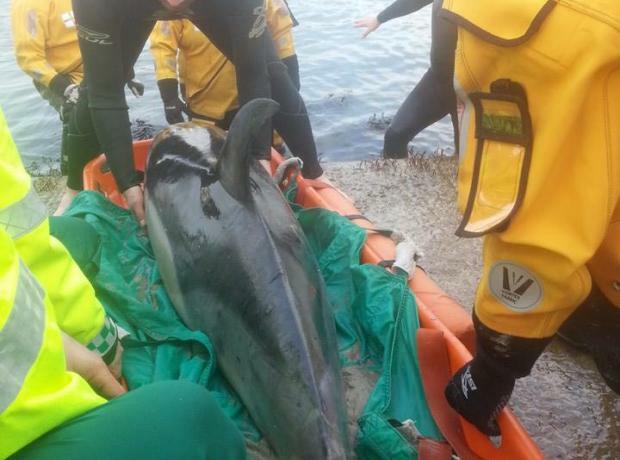 Today the GSPCA were called out to rescue a dolphin stranded on Pembroke Bay that was rolling in the surf. Geoff George Animal Collection Officer responded to the call that came in at midday and we quickly contacted local vet John Knight who has many years working with dolphins and similar species around the world to attend the scene. The Common Dolphin was extremely tired and there was no way that the animal could be re-floated with the rough gale force weather. Despite the cold snap some of our wildlife and animals have continued to produce young here in Guernsey. Only yesterday we were called to rescue two young pigeons which are now safe and warm in an Intensive Care Unit which was thanks to the Channel Island Christmas Lottery last year. Also in the last month we have had two tortie and white kittens who have been called Sparkle and Glitter (we currently have a waiting list for homes looking for kittens) and a duckling which has been called Quack Quack. We are pleased to report that today Felix our longest stay cat has gone to her new home. This makes Lamar the longest stay cat as he came in last March. Lamar is an independent lad and likes his own space. At only two years old he needs a home where he can do his own thing as he's not keen on cuddles.